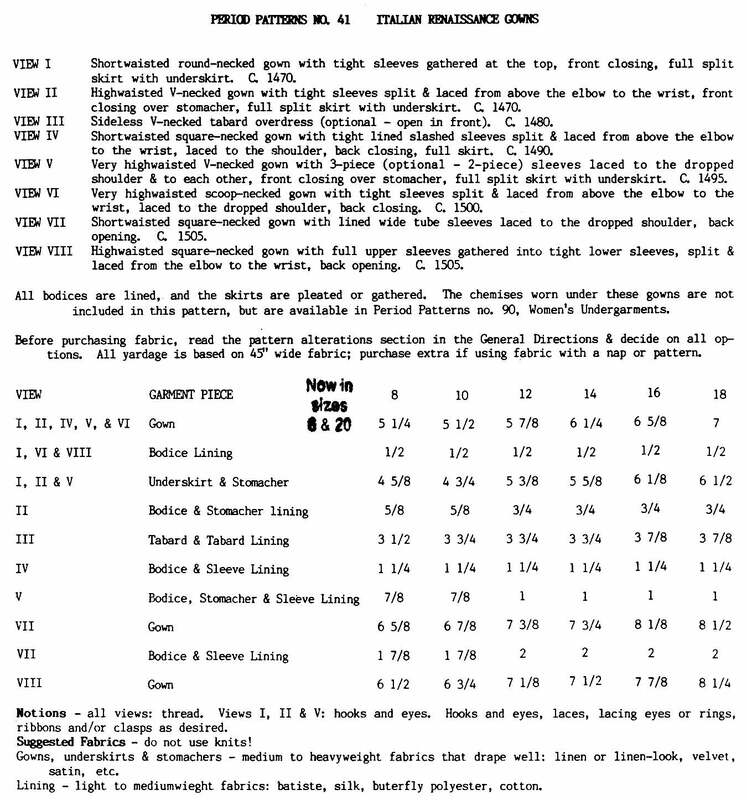 Pattern condition: Uncut, factory folded, complete with instructions, historical notes and illustrations. 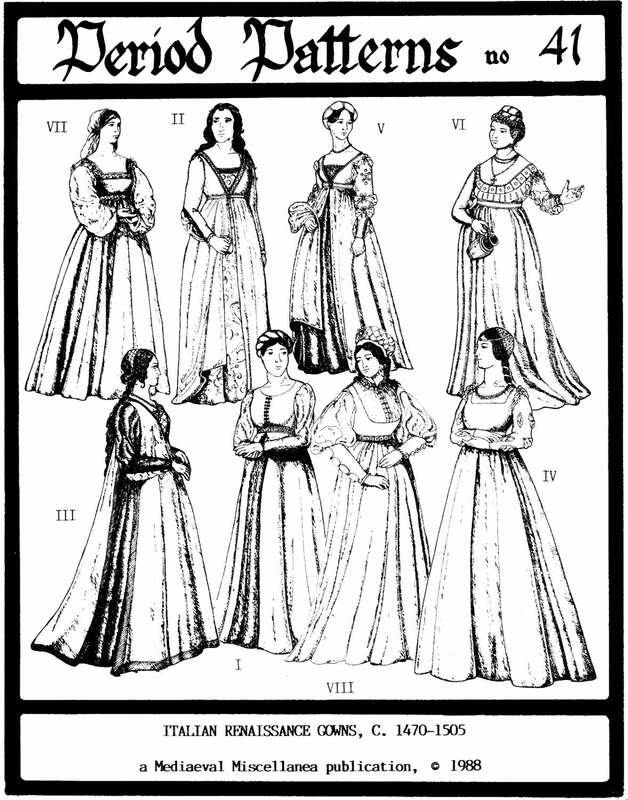 Women's Italian Renaissance Gowns, c. 1470-1505, provides patterns for 7 gowns and 1 tabard. Two have split skirts. underskirts, and stomachers, to fake an underdress. The underskirts and stomachers can be left off, replaced by a real underdress. 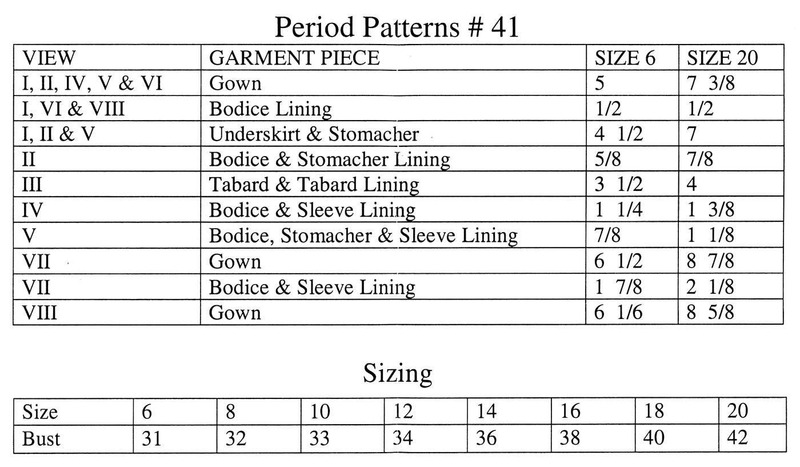 Four of the gown patterns have sleeves that tie on. View I - Shortwaisted round-necked gown with tight sleeves gathered at the top, front closing, full split skirt with underskirt. C. 1470. View II - Highwaisted V-necked gown with tight sleeves split and laced from above the elbow to the wrist, front closing over stomacher, full split skirt with underskirt. C. 1470. View III - Sideless V-necked tabard overdress (optional - open in front). C. 1480. View IV - Shortwaisted square-necked gown with tight lined slashed sleeves split and laced from above the elbow to the wrist, laced to the shoulder, back closing, full skirt. C. 1490. View V - Very highwaisted V-necked gown with 3-piece (optional - 2-piece) sleeves laced to the dropped shoulder and to each other, front closing over stomacher, full split skirt with underskirt. C. 1495. View VI - Very highwaisted scoop-necked gown with tight sleeves split and laced from above the elbow to the wrist, laced to the dropped shoulder, back closing. C. 1500. View VII - Shortwaisted square-necked gown with lined wide tube sleeves laced to the dropped shoulder, back opening. C. 1505. View VIII - Highwaisted square-necked gown with full upper sleeves gathered into tight lower sleeves, split and laced from the elbow to the wrist, back opening. C. 1505. All bodices are lined, and the skirts are pleated or gathered.